Marist Hockey Club was founded in 1964 and has remained as a successful and welcoming club within the Bunbury Hockey Association ever since. One of the biggest focuses of the club, is to develop the skills of our juniors that are coming though to ensure they reach their full potential in future years. Marist have a diverse number of teams to cater for everyone from Juniors Under 9's through to Years 9-12. The Senior Comp has both mens and womens teams in the A3, A2 and SWHL including Masters (Vets). With Clubrooms situated on the Bunbury Catholic College Campus, regular functions throughout the season are held to keep the team spirit alive off the field. 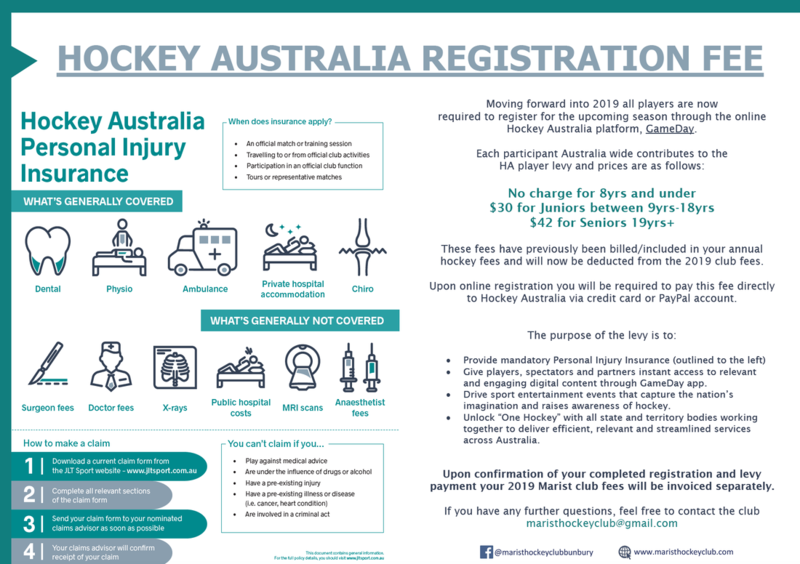 As of 2019, all registrations must take place through the Hockey Australia online platform SportsTG. The club has a new Facebook and Instagram page which will be use to distribute information throughout the season! Be sure to head over and check them out! ​days and at social gatherings. To find out more information about our commitment to being a Good Sports Club click here. for the 6th year in a row!!! ON WINNING THE 2018 PREMIERSHIP FLAGS!